Birds love to dunk and dip themselves regularly, though this can be a challenge for caged birds. Providing your feathered friend with a convenient bird bath will improve its mood, release stress and keep your bird looking beautiful. 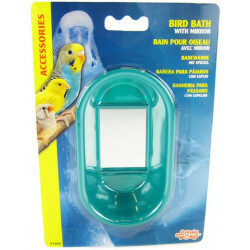 Pet Mountain carries a variety of fun, practical inside-the-cage bird baths that your pet bird will love. 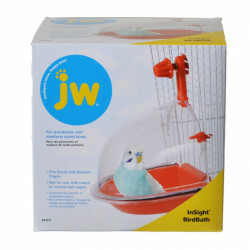 JW Insight's unique bird baths are the perfect options for bathing on the floor of the cage (in a fun bathtub shape), or for taking a dip above the floor with the Hook-On Cage Side Bath. Or, for a bathing experience that'll keep your bird interested for hours, check out Living World's Oval Bath with a built in mirror that will captivate and fascinate your pet.